Is It Fear or Anxiety? Is There a Difference? In people with anxiety disorders, the brain’s “hard drive” that controls the fear response goes awry. At the core of this part of the brain is the amygdala, a structure that flags incoming signals as dangerous or worrisome and communicates with other parts of the brain to put the body on alert. Early life events, especially traumatic ones, can impact this circuitry so that it is oversensitive and sends out alarms too often. We have to perceive real threats in order to survive, but those with anxiety see threats where there aren't any, perhaps because emotional memories or defective genetics color their perceptions. There are a variety of treatments available for managing anxiety, including several effective medications and specific forms of psychotherapy. In terms of medications, buspirone (Buspar) is known to be quite effective for treating GAD. However, it seems to be less effective in managing many other disorders that often co-occur (are comorbid) with GAD. Therefore, specific members of the selective serotonin reuptake inhibitor (SSRI) and the selective serotonin and norepinephrine reuptake inhibitor (SSNRI) drug classes, which are also approved by the U.S. Food and Drug Administration (FDA) for effective treatment of GAD, are prescribed more often. Examples of SSRI medications include fluvoxamine (Luvox), fluoxetine (Prozac), sertraline (Zoloft), paroxetine (Paxil), citalopram (Celexa), and escitalopram (Lexapro). Examples of SNRI medications are venlafaxine (Effexor) and duloxetine (Cymbalta). Although buproprion (Wellbutrin) is primarily known to primarily treat depression, preliminary research suggests that it may not be very helpful in the treatment of anxiety; sometimes making patients feel more agitated. Benzodiazepine medications like clonazepam (Klonopin) and lorazepam (Ativan) are more useful in stopping severe anxiety symptoms, like those that occur in panic disorder or in posttraumatic stress disorder rather than the ongoing worry that is usually associated with GAD. Although alprazolam (Xanax) is often used to treat panic attacks, its short duration of action can sometimes result in having to take it several times per day. Medications from the beta-blocker family (for example, propranolol [Inderal]) are sometimes used to provide rapid relief of the physical symptoms associated with a panic attack. Some individuals who suffer from severe panic attacks may benefit from treatment with neurontin (Gabapentin), which was initially developed to treat seizures, or may benefit from a neuroleptic medication like risperidone (Risperdal), olanzapine (Zyprexa), quetiapine (Seroquel), or aripiprazole (Abilify). Zolpidem (Ambien) has been found helpful in treating the insomnia that can often be a symptom of anxiety. Before SSRIs and SSNRIs became available, medications from the group known as the tricyclic antidepressants (TCAs) were often used to address panic disorder. Although TCAs have been found to be equally effective in treating panic attacks, SSRIs and SSNRIs have been proven to be safer and better tolerated. Therefore TCAs are used much less often than they used to be. When used in the appropriate person with close monitoring, these medications can be quite effective as part of treatment for panic disorder. For individuals who may be wondering how to avoid panic attacks using treatment without prescribed medications, natural remedies may be an option. While treatment like hypnosis and herbal supplements that contain kava have been found to be helpful for some people with some anxiety disorders, the research data are still considered to be too limited for many physicians to recommend treatment with other natural remedies like valerian or passionflower. Also, care should be taken when taking any dietary supplements, since dietary supplements and "natural" remedies are not regulated in terms of quality, content, or effectiveness. 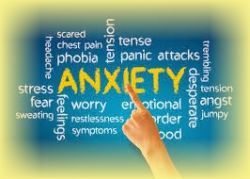 The psychotherapy component of treatment for anxiety disorders is at least as significant as the medication treatment. In fact, research shows that psychotherapy alone or the combination of medication and psychotherapy treatment are more effective than medication alone in overcoming anxiety for both adults and children The most common type of therapy used to treat anxiety is cognitive behavioral therapy (CBT). This form of therapy seeks to help those with an anxiety disorder identify and decrease the irrational thoughts and behaviors that reinforce anxiety symptoms and can be administered either individually, in group therapy, and even in partner-assisted therapy. CBT that seeks to help the anxiety sufferer decrease the inclination to pay excessive attention to potential threats has also been found to be helpful. Behavioral techniques that are often used to decrease anxiety include relaxation techniques and gradually increasing exposure to situations that may have previously precipitated anxiety in the individual. Helping the anxiety sufferer to recognize and handle the emotional forces that may have contributed to developing symptoms has also been found to be effective in teaching an individual with panic disorder how to prevent an anxiety attack or to decrease or stop a panic attack once it starts. Often, a combination of psychotherapy and medications produces the best results. Improvement is usually noticed in a fairly short period of time, about two to three months (sometimes less). Thus, appropriate treatment for anxiety can prevent symptoms or at least substantially reduce their severity and frequency, bringing significant relief to many. There are also self-care measures that people with anxiety can do to help make treatment more effective. Since substances like caffeine, alcohol, and illicit drugs can worsen anxiety, those things should be minimized. Other tips to prevent or manage anxiety symptoms include engaging in aerobic exercise and stress-management techniques like deep breathing, massage therapy, and yoga, since these self-help activities have also been found to help decrease the frequency and severity of symptoms. Although many people breathe into a paper bag when afflicted by the hyperventilation that can be associated with panic, the benefit received may be the result of the individual believing it will remedy the symptoms (placebo effect). Also, breathing into a paper bag when one is having trouble breathing can make matters worse when the hyperventilation is the result of conditions of oxygen deprivation, like an asthma attack or a heart attack. People with an anxiety disorder may also need treatment for other emotional problems. Depression has often been associated with anxiety, as have alcohol and drug abuse. Recent research also suggests that suicide attempts are more frequent in people with an anxiety disorder. Fortunately, these problems associated with panic disorder can be overcome effectively, just like panic disorder itself. Sadly, many people with anxiety do not seek or receive treatment. There is no reason to suffer needlessly when treatment is so effective and available. © Copyright 2014 by John Newmark, therapist in North Miami Beach, Florida. All rights reserved.